Throughout history of mankind we have understood the benefits of essential oils. The uses of essential oils are endless from natural cleaning and beauty products to boosting your immune system and emotional wellness. The essential oils that you choose will depend largely on your needs. Are you looking for an oil to natural treat your acne or to ease persistent migraine headaches? Or perhaps you'd like to focus on aromatherapy to create a more peaceful environment. 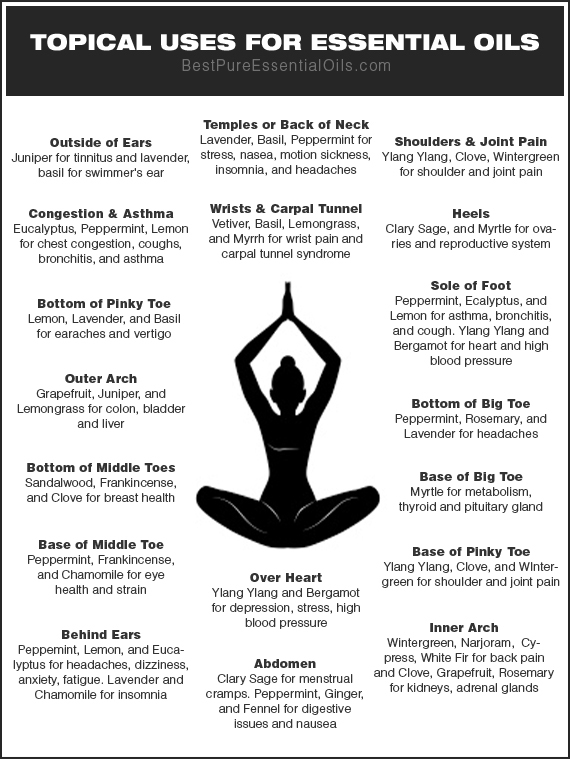 Hopefully you've found a few essential oils to call your own after reviewing the chart. If you're experiencing information overload we recommend trying one of the seven most common essential oils shown towards the bottom of our 'What Are Essential Oils' page. Now that you've decided on an essential oil, or two, you will likely need to pickup a quality carrier oil to support your essential oils. Carrier oils ensure that essential oils used topically (ointments, lotions, soaps, etc) are comfortable to your skin. Most essential oils can not be applied directly to the skin without being diluted. Diluting with a carrier oil does not weaken the effect of the oil. Some of the best carrier oils are olive oil, coconut oil, almond oil, grapeseed oil, hemp seed oil, and avocado oil. Even the most gentle essential oils can still cause irritations if you have sensitive skin. If you are prone to sensitive skin or skin reactions highly diluted your oils first to conduct a quick patch test. Apply 1–2 drops of essential oil to an area of skin such as the inside of your upper arm. Pay attention to the applied area over the next few hours. If you experience a hot or burning sensation or develop a rash you will need to either discontinue the use of that essential oil topically or dilute further. Keep in mind, you can develop skin irritations from an essential oil from consistent use over the same area of the body in a short amount of time. Diluted essential oils can be applied to many areas of the body for effective results but avoid sensitive areas such as your eyes and mouth. View the illustration below to learn the best ways to utilize carrier oils with your essential oils for topical treatments. Want to learn more about how you can use essential oils into your everyday life? Check out all the DIY Uses for Essential Oils now! Lastly, and this is huge, we recommend you pick up an essential oil diffuser. An oil diffuser is utilized for the aromatic affects of essential oils. Aromatic applications such as nurturing the respiratory system, balancing moods, and increasing indoor air quality. When you diffuse an oil you are receiving a fine mist or vapor of the oil, containing all the same properties of the oil itself. There's nothing quite like the wonderful, calming smell of lavender in your home. Try Eucalyptus to clear your sinuses or Peppermint for increased mental clarity. These are just a few of the amazing essential oils you can diffuse with most having many benefits beyond just smelling great. Once again review the chart to see the many benefits of essential oils and don't be afraid to choose from the most popular essential oils to get you started in the right direction.